Can the Runner play two Encores on the same turn? If the Runner has enough clicks in a single turn to run successfully on R&D, HQ, and Archives then play two Encores, then the Runner takes two additional turns after that one. At first glance, this just seems like a difficult and unreliable way to gain three . After all, it is usually quite costly to successfully run at all three central servers in one turn. It is actually a bit better than that. 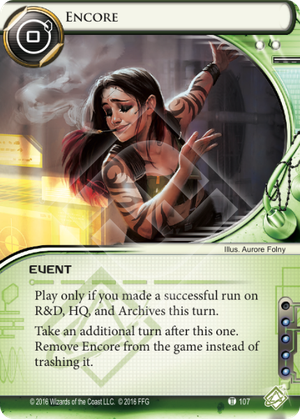 Still, Encore probably won't find its way into many decks. Why is it a bit better? Because it gives you another turn rather than just extra s, this will satisfy a number of beneficial triggers. -Drip income cards like Underworld Contact and Data Folding will supply fresh s.
-Also available are s. Ele "Smoke" Scovak: Cynosure of the Net, Lockpick and the like. -Cards like Patron and Security Testing can be used again. -Even cards like Beth Kilrain-Chang and Rachel Beckman activate again potentially earning you more s from Encore. Ways to make it easier. -Omar Keung: Conspiracy Theorist has an easier time, but there's probably no way he will include this card because of the four influence cost. -Sneakdoor Beta will serve much the same purpose, making your HQ run potentially easier. -And of course, old faithful, DDoS. -Caprice Nisei, Marcus Batty, Crisium Grid, and Nisei MK II are among the ways Corporate can stop you. How does Encore stack up to other three-run events? -Notoriety guarantees an extra point. -Quest Completed can easily get you more than one point. -Upcoming Exploit is potentially game changing too. I think this card will be fun to play around with. And against certain decks you may find it easy to pull off. But against many, it'll be difficult. And four influence is quite restrictive, so probably only Shapers will attempt it. Also, don't use drugs if you are attempting an Encore. You'll end up paying your dealer for nothing.